As editor of ___Mom Knows Best___ it is my passion, job and duty to bring you the best deals available on the world wide web. We have all made it our mission to never accept the starting price on anything, and always search for the best deals. But, what if I told you there was a start-up that is changing everything and developing a way to get you the best possible deals WITHOUT the hunting, cutting and spam! I am happy to introduce you to Kurrenci.com the internet’s very first universal coupon. At first this sounds too good to be true, but it’s not, they already have several sites accepting Kurrenci! See skincareheaven, babybot, voilaccezzories, babybot and others! 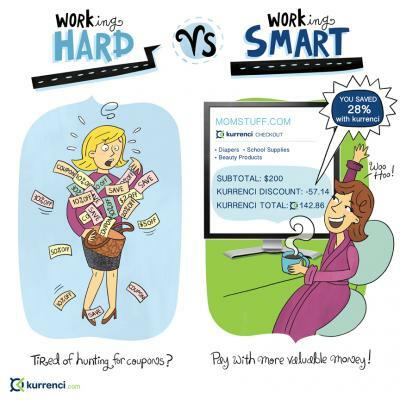 So go to Kurrenci.com today, and sign up for your free account!